Jockey Jose Ortiz celebrates aboard Oscar Performance after winning the Juvenile Turf. 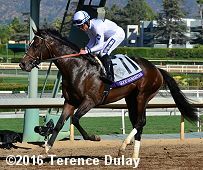 The first race of the 2016 Championships was the $1 million Breeders' Cup Juvenile Turf (G1), a 1 mile test around 2 turns of infield turf course at Santa Anita. Good Samaritan was sent off as the 5-2 choice in the full field of 14 off his win in the Summer Stakes (G2). 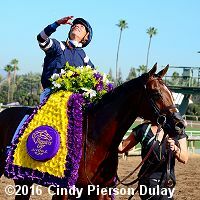 In to challenge him include 4-1 Big Score, winner of the Zuma Beach after finishing second in the Del Mar Juvenile Turf, and 13-2 Oscar Performance, winner of the Pilgrim Stakes (G3). Oscar Performance draws away in the stretch. Jockey E.T. Baird sent 30-1 Wellabled to the lead first time by through fractions of 22.30 and 45.88 over the firm going while pressed by Oscar Performance and stalked by 28-1 Keep Quiet. On the far turn Jose Ortiz sent Oscar Performance to the front through 3/4 in 1:09.44 and 7/8 in 1:21.07, opening up by 2 with a furlong to go. 8-1 Lancaster Bomber, 8th early, put in a strong late rally but Oscar Perfomance easily held him off by 1 1/4 lengths in 1:33.28. It was a neck back to late-running favorite Good Samaritan third. Left: Oscar Performance heads to the winner's circle. 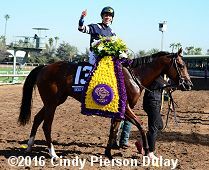 Jockey Jose Ortiz said, "He played out just like we planned it. That was the key, I think. The key was going through the first turn, have a clean break, and get up a good position in the first turn, and we did that. And he re-lapped well behind Wellabled. I was a little concerned about that, because he had been on the lead lap two times. 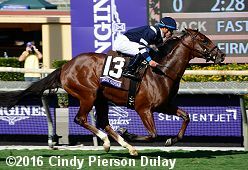 But he re-lapped well, and when I past the 3/4 pole, I felt like I had a lot of horse under me, when I let him go in the 1/4 pole, he did very well." 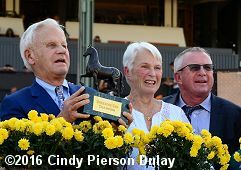 Right: The trophy celebration with owners Mr. and Mrs. Jerry Amerman and trainer Bryan Lynch. Jerry Amerman said, "I don't want to get into a deep subject because there are so many different viewpoints. But if the horse is doing well, there is no need for medication when they're two years old, and that's the principle we've followed. If something goes wrong, obviously it's a different issue and we might use Lasix. But until then, we stay without it." Oscar Performance was one of two horses in the field to not use race-day medication. Left: Oscar Performance heads out for the post parade. Right: Oscar Performance heads back to the barn after the race. Trainer Brian Lynch said, "We haven't really considered dirt. He's a Kitten's Joy out of a Theatrical mare, so his pedigree's definitely top and bottom grass. So at this stage we'll talk with John and Jerry about the next step, but he definitely deserves a nice little break after today's performance. You know, that's his fourth start as a two-year-old. I think that's plenty for him. And we look forward to him in the spring." Left: Second place finisher Lancaster Bomber in the post parade. 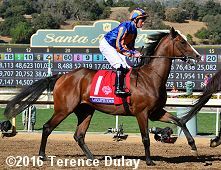 Jockey Seamie Heffernan said, "He didn�t break quite as well as the American horses, but he ran a great race. I think he was as good as the winner, but the winner had a better trip." 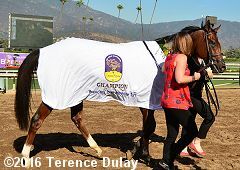 Trainer Aidan O'Brien added, "I was very pleased with that. He ran a super race and stayed on well at the finish." Right: Third place finisher and beaten favorite Good Samaritan returns after the race. 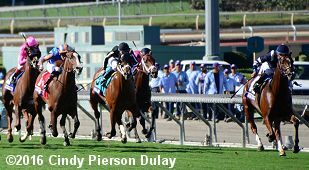 Trainer Bill Mott said, "Joel said whoever was on the seven nearly clipped heels and he had to take back. He was shuffled back to next to last after sitting mid-pack heading into the turn. It might have been a good effort to finish third. It�s hard to say. I�d like to watch the replay to try and put it all together." The horses break from the gate for the Juvenile Turf. 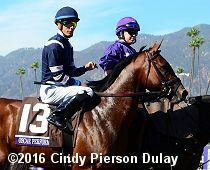 Joel Rosario aboard favorite Good Samaritan (11) said, "On the first turn, it looked like the horse in front of me clipped heels so I had to take a hold of him and wait a little longer. After all of the (early trouble), he responded very nicely. He�s a good horse."